Who doesn’t love a crazy or funny lottery story..? Give normal everyday people a lottery jackpot and some of them just cannot help but go totally crazy. 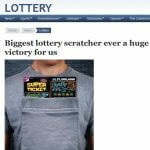 Have you ever bought scratch-off tickets in bulk? Ever fancied trying it out? Well, this guy did. And here’s exactly what happened when he spent $2,700 on tickets. When a Danish Father tells his two sons that he has won a huge lottery prize, there is not much reaction- at first. Even if you don’t speak Danish, the expressions in the voices speak volumes (don’t worry, there are English subtitles). But don’t worry Powerball, it’s all over now — until next time. I’ve already watched this like 6 times, and it still makes me laugh. How does an MLB player react after being fooled into believing he had won a $10,000 jackpot? Watch just how happy it made the guy feel – before he found out about the prank. The setting is a post apocalyptic New York populated by three living people, and a whole lot of zombies. You may have heard of the fairy tale about the goose that lays golden eggs. Mark Brown is a man who plans to lay most of a million dollars in winnings on chickens. At least two candidates for the post of Governor of Bangkok has raised doubts about the drawing of the Thai Lottery. One man who is candidate no. A celebration for winning $75,000 in the lottery turned tragic for two brothers from Wichita, when they accidentally blew up their house. They had bought marijuana and crystal meth for the celebration, but when one of them tried to refill butane torches they planned to light their bongs with, escaped butane blew the house up.